Oslo is sweltering in the summer heat when a young woman is murdered in her flat. One finger has been cut off and a tiny red diamond in the shape of a pentagram—a five-pointed star—is found under her eyelid. Detective Harry Hole is assigned the case with Tom Waaler, a colleague he neither likes nor trusts. He believes Tom is behind a gang of arms smugglers—and the murder of his partner. But Harry, an off-the-rails alcoholic, is barely holding on to his job and has little choice but to play nice. LOVE the cover, and especially now that I've read the book I see the significance. What an interesting way to start a story. I'm drawn in and I don't even quite know what's going on yet! I love it! On a roll with mystery/crime novels lately, I was more than happy to take on The Devil's Star when it arrived at my door. I curled up into the back seat of our car on the way home from a trip, and dove in. Let's just say that the two and a half hour trip FLEW by. When we arrived, I was done, completely baffled by the ending (in a good way), and really confused about how we had gotten home so quickly. 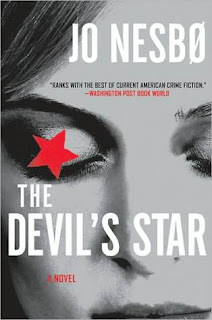 The Devil's Star is the brainchild of Jo Nesbo, and is the third Harry Hole novel to make the transition from its Norwegian roots to English. I wasn't aware when I first got the book that it was part of a series, but honestly it doesn't make much of a difference. Nesbo brings his characters to life so vividly that whether I was meeting Harry for the first time, or the third time, I still would have known all about his destructive and rather selfish lifestyle. Along with the cast of supporting characters, Harry's background story is woven into the overall murder mystery extremely well. See Harry is an alcoholic, and Nesbo has no qualms with showing the gritty and realistic side of that lifestyle. Harry's character is like a walking tornado, making choices that seem to benefit him. but often leave others devastated in his wake. It's apparent that Harry is a complete mess, and his whole life suffers because of it. However, you also see the part of him that truly cares about what he does. As Harry navigates the mystery surrounding the murders you see the part of him that genuinely wants to solve these murders and lay things to rest. Sadly it's all too much and it leads him to drink. Harry is the type of character that you want to hug and then slap at the same time. Well paced, and intriguing without being too bloody or gory, Nesbo weaves a murder mystery that will have you on the edge of your seat. With just enough red herrings thrown in completely baffle you, the ending comes as a huge surprise! The twists and turns are amazing, and I found myself on the wrong track more than once, only to realize that I was being mislead. It was fantastic. I won't lie, I didn't see the ending coming at all. Which is surprising because I generally solve these types of crime novels by half way through! Well played Nesbo, well played. If you are a fan of novels full of mystery and suspense, or if you just love a good read, pick up a copy of The Devil's Star and dive in! I can guarantee you'll be through it in no time and wondering how to get your hands on the rest. Yes, it's that good. Source: Received by TLC Book Tours.